On a recent Monday evening I had a real craving for comfort food. I know it’s July, but Mondays are still Mondays! It didn’t want anything too rich and still wanted it to be a little healthy so I was feeling a bit stuck. I had a full head of cauliflower that was beginning to look a little sorry for itself so I decided to roast it and make a soup. After some googling, I came across this recipe from Nigel Slater. Bingo! I’ve already praised the gorgeous spice mix of ras el hanout so I thought this would be perfect. Roasting the cauliflower brings out a really pleasant nutty flavour in it. Cooking it this way and then blending it with the stock means there is very little fat in it but it still tastes really creamy. Perfect healthy comfort food. It also freezes really well so you can do an even bigger batch if you need to. Remove the outer green leaves of the cauliflower and then break it into florets. Peel and quarter the onion(s) and peel the garlic. Cut the celery into large chunks. 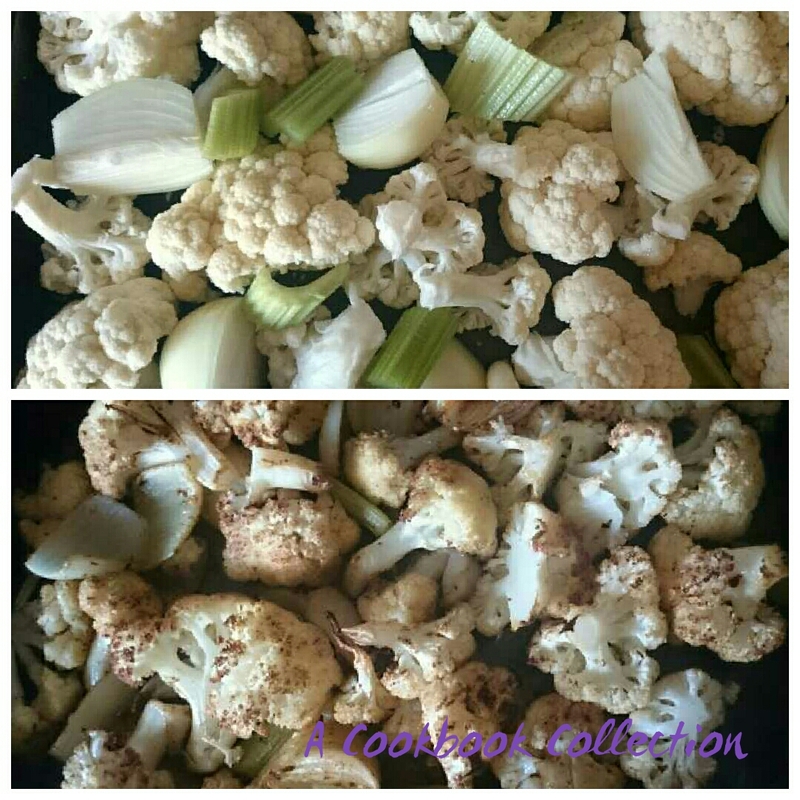 Put the cauliflower, onions, garlic and celery into a roasting dish. Season with salt and pepper, the ras el hanout and pour a nice amount of olive oil on top. Use your hands to give everything a good mix and put it in the oven to roast, stirring every 20 minutes or so to stop the veg from sticking. Roast for about 45 minutes or until a knife goes through the cauliflower easily, but you don’t want it turned to mush. If your cauliflower pieces are large it could take up to an hour to be cooked. When your vegetables are all cooked, pour the entire contents of the roasting dish into a blender. Add the stock and blend until you have a thick creamy consistency. You could pour all of the ingredients into a saucepan if you want to blend it with a stick blender. Taste the soup and season with more salt and pepper or even more spice mix if it is needed. While the soup is blending, heat a dry non stick pan over a medium heat. Throw in the flaked almonds and allow to toast to a golden brown. This will happen quickly so keep an eye on them and shake the pan regularly to stop them burning. If the soup is too thick for your liking add some boiling water. You could stir in some cream but I don’t think this soup needs it. You could also pass it through a sieve if needed but it should be smooth enough as is. 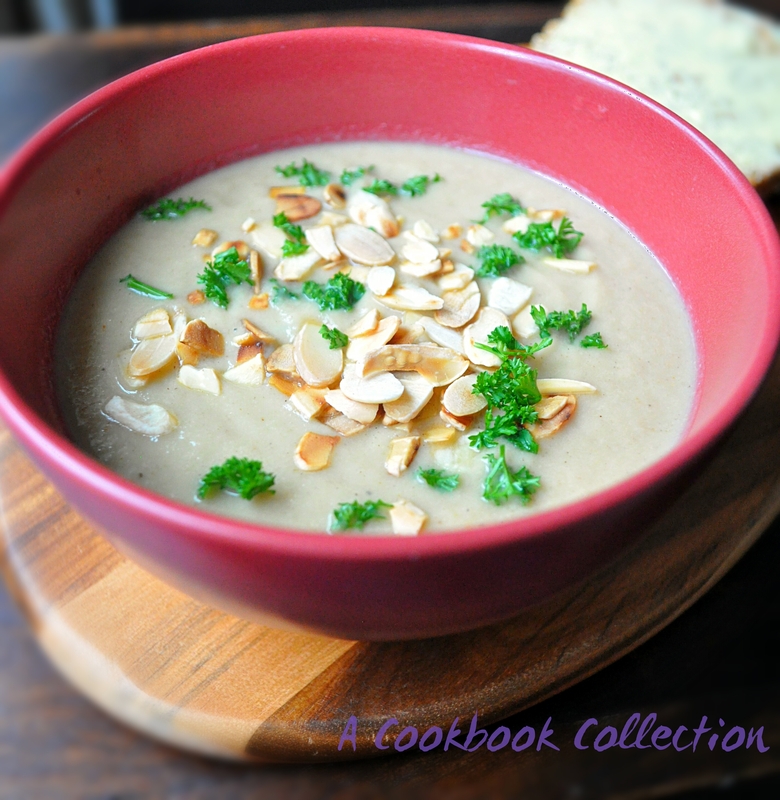 Serve with a sprinkling of toasted almonds and some chopped parsley, just to add some colour. This bread is really nice served on the side. Is that you I see in the spoon? On a related note, if you hold the back of a dessert spoon up close to your nose, you get to look like Barry Manilow. Try it! Well aren’t you eagle-eyed! I was waiting for someone to spot that. No seriously! It’s one of my main kitchen tips. You’ll piss yourself laughing. Try it. 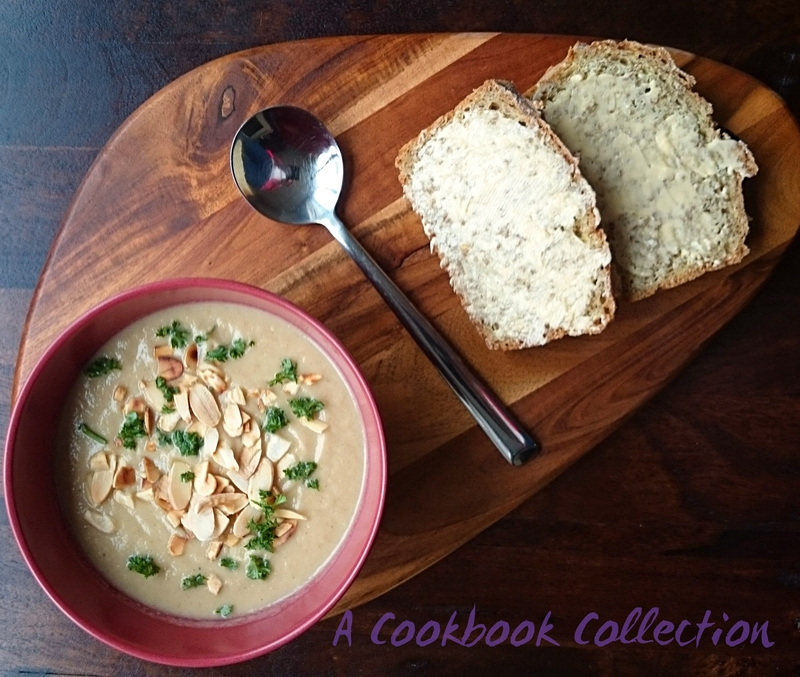 it is still a bit too hot for me to try this soup right now, but I will be trying it as soon as the weather gets a bit chillier. Looks amazing. Thanks for sharing!